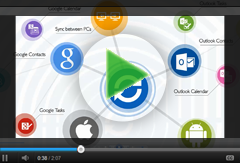 Microsoft Outlook sync between multiple PCs or with Google Account. Those who work in several places and use Microsoft Outlook on several devices, Outlook sync is a necessity. Sync2 for Outlook is a tool that will take care of synchronization between as many computers as you want. This powerful Microsoft Outlook sync software works for many different case scenarios and meets a variety of different needs. Synchronize between work PC and laptop. Sync the same folders with any number of Outlook users. You can also sync your Microsoft Outlook with Google Services (Contacts and Calendar). Synchronization can be set up in a few easy steps. For synchronization, you can use a shared Network location, FTP connection, USB drive or any other removable memory device. We offer our 4Team FTP Sharing Service for free. Select Outlook folders you want to sync, define settings and filters, if needed, and you are ready to be in sync. Do not worry about duplicate items, Sync2 automatically resolves duplicate issues and back up in case you want to restore old version of changed item. Use Sync2 for Google Calendar and Gmail Contacts sync with Outlook. Synchronization between Google and Outlook will help you keep your data organized. And in case something happens to one of the accounts, you will have a backup copy of your precious contacts and calendar in the other account. After Google and Outlook are in sync, Microsoft Outlook Contacts and Calendar can be reached via Web and smartphones. The sync is bidirectional (both ways), or you can select only one- direction synchronization.